This graphic was originally published by Sohu Business. 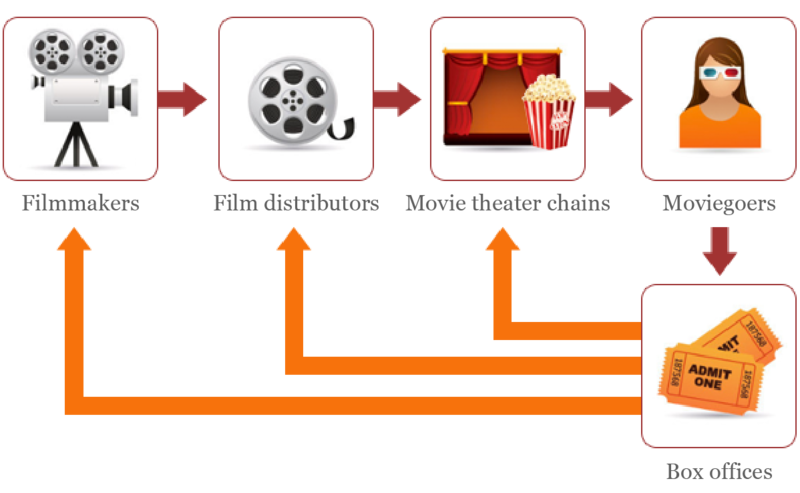 There are actually four unofficial “domestic film protection” periods each year in China—times when imported films allowed to share in box office revenues effectively are barred from theatrical release in China. The longest occurs for roughly six weeks during the school summer vacation in July and August. In addition, there are three shorter such “blackout periods” of between one and two weeks that occur at the Lunar New Year (Feb 8-15, 2016), at the National Day holiday (Oct 1-7), and around Christmas and the New Year in the western calendar. In 2014, Chinese annual box office earnings exceeded 29 billion RMB. As of July of this year, box office sales had reached 25.9 billion. Chinese films keep smashing box office records, and surpassing 100 million in sales has become a bare minimum. 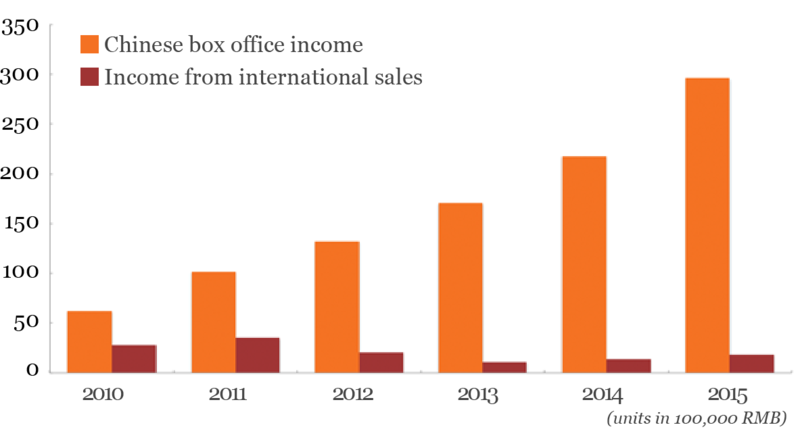 Behind the myth of steadily increasing annual box office sales is a gamut of hidden rules. 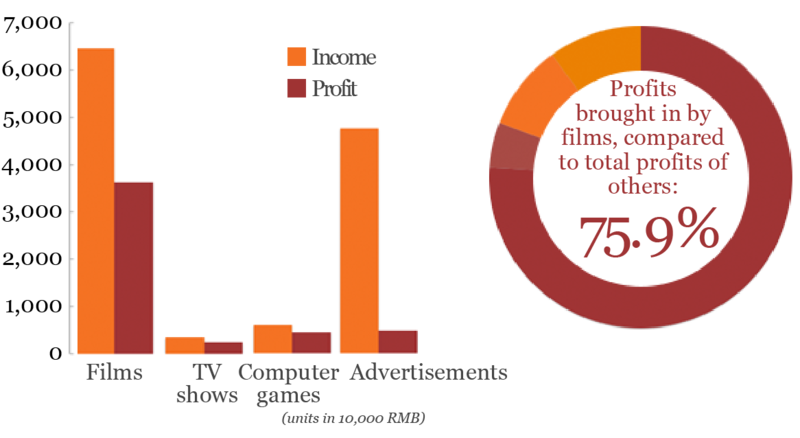 When filmmakers present a film, box office sales are determined by how many tickets are bought by moviegoers at the theaters. Most important is how many showings movie theaters schedule, since the higher a film’s percentage of showings per day, the more times the movie will be seen and the higher the box office receipts will be. 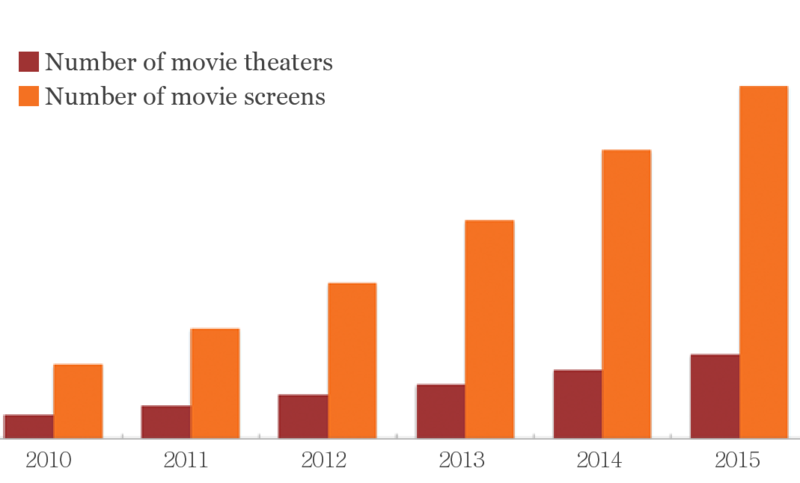 By 2014, there were 5,813 movie theaters in China, with a total of 24,317 movie screens. 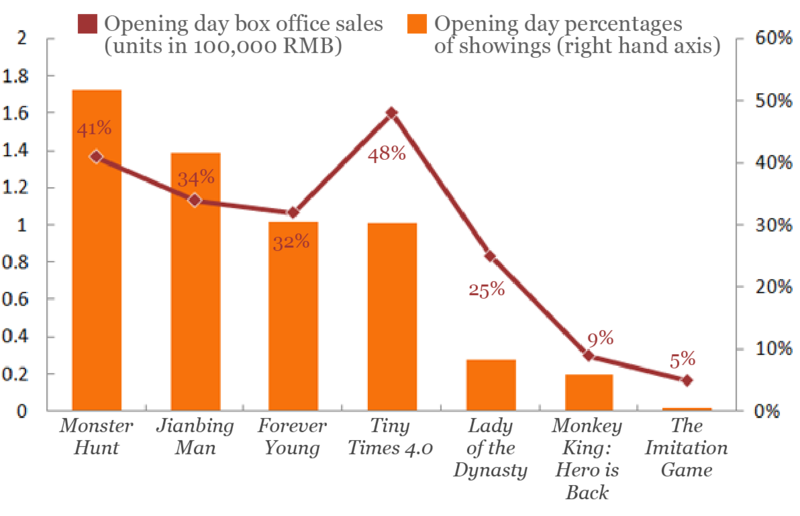 Normally, if the percentage of showings per day for a movie rises above 30%, the box office sales will be considerable. These highly disparate percentages of showings result in an enormous difference in box office earnings. And box office earnings affect whether the producer and distributor of a film will receive international attention, so both sides will try anything to raise the percentage of showings. How Does a Movie Manage to Get a High Percentage of Showings? 1. Returns for “co-productions” lead to a high percentage of showings. 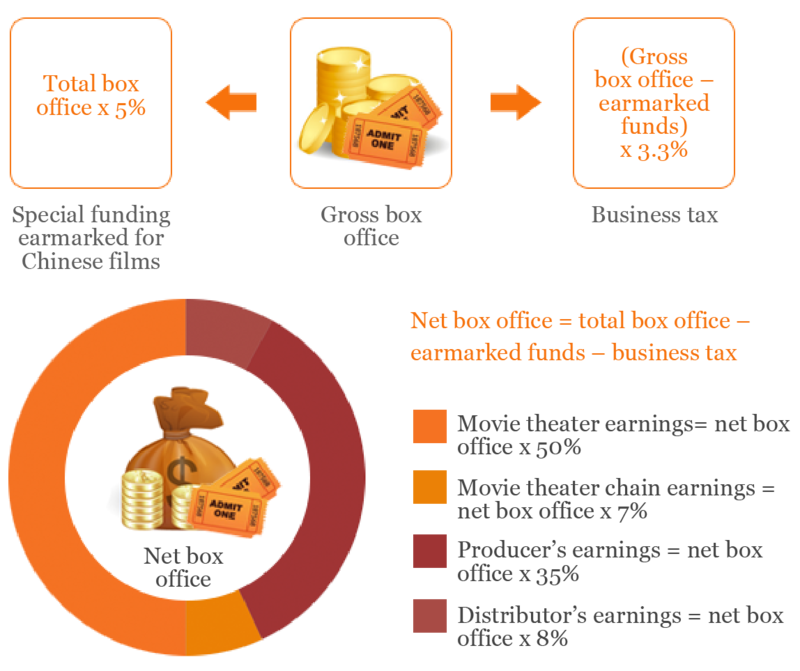 First, how do Chinese films share box office earnings? 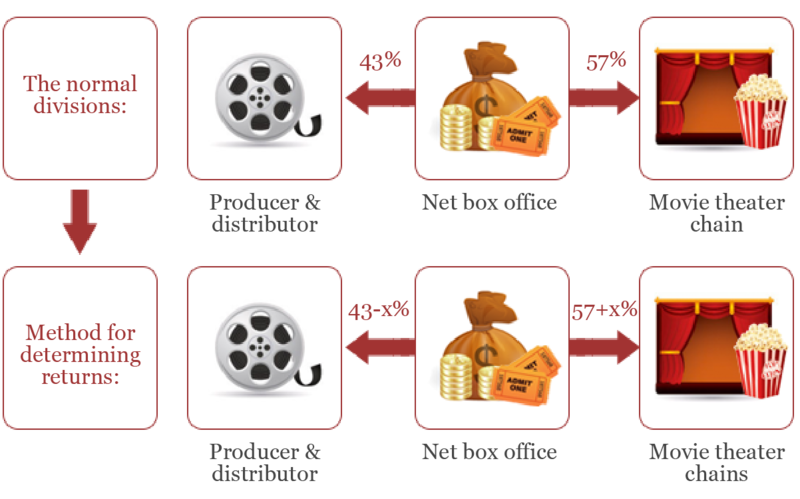 Returns are 2-10% taken out of the producer and distributor’s combined 43% and given back to the movie theater chain. With this incentive, chains naturally will offer more showings, guaranteeing that those movies have an advantage in the fierce box office competition. So the rate of the return will change according to box office sales. However, it isn’t as simple as the higher a percentage of showings, the better. Attendance rates also have to be taken into account. 2. Direct “cooperation” with movie theaters to buy out showings results in high attendance rates and helps maintain a high percentage of showings. Distributors don’t need to buy all of the tickets for a showing. A movie theater can use normal methods to sell a portion of the tickets. Generally a 50% attendance rate at a screening will guarantee a profit for the theater. But it isn’t enough for the producer to pay large “bribes” to movie theater chains. Even more important is to offer discounted tickets to attract ordinary moviegoers. Following the rise of online platforms, many producers have chosen to work with online sellers to sell discounted tickets to viewers. 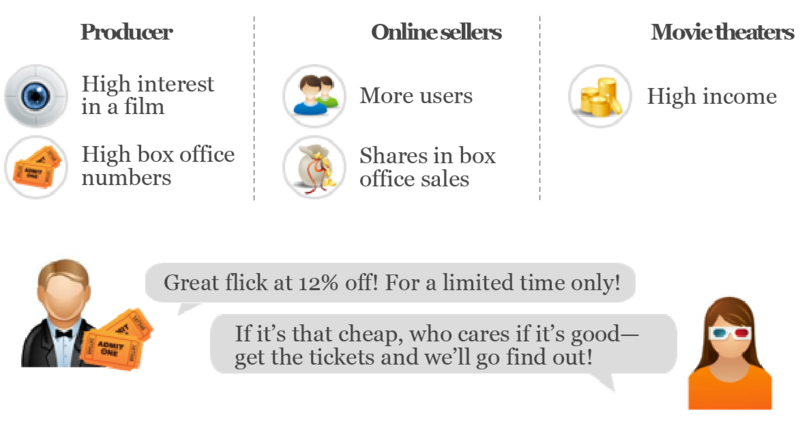 This new way of selling tickets over the Internet means that each movie faces a price war for box office sales, and huge price differences lead to heated purchases, more ordinary moviegoers going to the movies, and an increase in box office sales. But is this unending outlay of net costs really worth it? Chinese films still make a profit mainly by relying on box office sales. Videos contribute more than half of a film company’s total income, and taking out net costs, they are the best source of annual profits. Box office sales of course guarantee overall profit. When high box office sales lead to higher earnings, stocks in the media company will see a spike. Enlight Pictures—New Classics Media Corp.
Guangdong ALPHA Animation & Culture Co., LTD—ALPHA Film Corp.
Kunlun Tech Co., LTD.—Heli Chenguang Media Co., LTD.
Songcheng Performing Arts Development Co.—Dasheng International Media Co.
Clearly, the successful run of a film can have a certain degree of influence on the stocks of the companies behind it. When these films occupied a top position at the box office, the publicly traded companies behind them saw a rise in their stock prices. So, with such high box office sales in China, are international box office sales high as well? Outside of China, Chinese films are not very competitive. 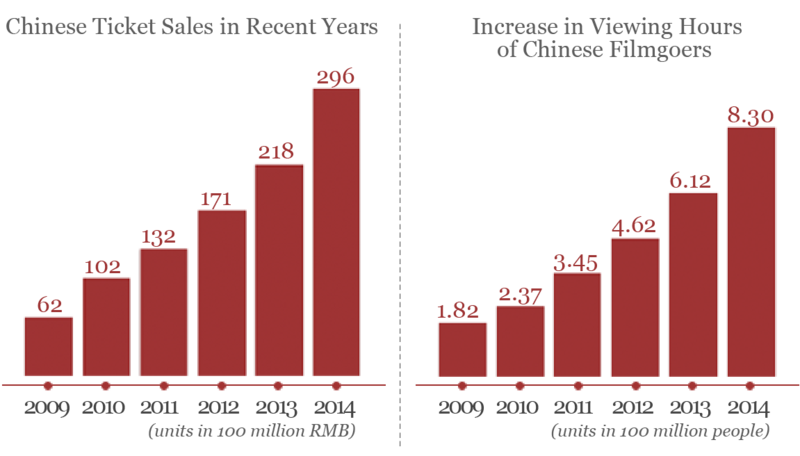 For all of 2014, Chinese movies earned only 1.87 billion RMB in international sales. This is because, whether in terms of the quality or in terms of global distribution mechanisms, Chinese films still fall far short of international films. The hidden rules behind the Chinese film industry make it impossible for films to receive equal treatment in China. Movie theaters aren’t run as charities. Their only goal is to make a profit. During the unofficial “domestic film protection month” in particular, international films will disappear from screens, leading to the misleading phenomenon of gloomy box office sales for Oscar-nominated films.